When a family qualifies for subsidized child care, that qualification is not open-ended; a family is certified to receive the subsidy for only a certain period of time, during which they must continue to meet eligibility criteria and are often required by States/Territories to report interim changes in circumstances. In most places, the redetermination period has usually been set at either 6 or 12 months, with families sometimes losing subsidies during the period due to changes in circumstances affecting their eligibility. The establishment of these policies was previously left up to the States and Territories. Now, the reauthorization of the legislation that governs federally-funded child care subsidies has put in place a national-level policy requiring redetermination periods of at least 12 months, with related rules covering situations when income increases or families experience other changes that affect eligibility.1 States and Territories will need to change their policies to meet the new federal requirements. The Child Care and Development Fund (CCDF) provides funding from the Child Care and Development Block Grant (CCDBG) to the States, District of Columbia, and Territories to administer child care subsidy programs for low-income families.2 States/Territories must comply with broad federal guidelines, including but not limited to establishing income eligibility limits at or below 85 percent of state median income (SMI); setting the maximum age for children at or below 12 years, or at or below 18 years if children have special needs; and defining what activities qualify for assistance (work, education, training, etc.). Within the broad federal guidelines, States/Territories are given discretion to establish many of the detailed policies used to operate their CCDF programs. In this brief, we look at current State/Territory policies for ongoing eligibility as they are addressed in the new legislation in order to understand what State/Territories are currently doing and how those policies might have to change. We discuss three broad policy areas: redetermination periods, income limits for ongoing eligibility, and family reporting requirements. For each policy area, we provide an overview of the policy, a snapshot of State/Territory policies prior to CCDBG reauthorization, and a description of how the policies will have to change to align with the new requirements. Finally, we provide information about additional resources for understanding State/Territory policies and CCDBG reauthorization. The policies discussed in this brief are drawn from several resources. We use the CCDF Policies Database to understand current State/Territory policies, and the CCDBG legislation, as well as the CCDF Plan Preprint, to describe the federal policy requirements. The U.S. Department of Health and Human Services (HHS) has issued proposed regulations based on the new law. In addition to providing information on how to implement the law, the regulations may include additional requirements, within the CCDBG legislation, for States’/Territories’ child care subsidy policies. Policies related to eligibility periods, ongoing eligibility requirements, and family reporting requirements can impact how long families keep child care subsidies, which can also affect how long a child can remain with the same provider. Additionally, policies related to entrance and exit thresholds and how quickly families are phased off assistance once they no longer meet initial eligibility thresholds can affect a family’s ability to provide continuous care for their children. Redetermination periods prior to CCDBG reauthorization varied by State/Territory and sometimes varied according to a family’s particular circumstances or eligibility group. As of October 2014, almost half (25) of the CCDF programs used a redetermination period of less than 12 months for most families (figure 1 and appendix table 1), with 24 States/Territories using a six-month period and one State using an eight-month period. More than half of the States/Territories (31) used a 12-month redetermination period. While the redetermination periods specify the general requirement, States/Territories often set shorter periods in cases where a parent’s approved activity (work, education, or training) is expected to last fewer months. For example, a State/Territory might have a redetermination period of 12 months, but if the parent indicates his or her training activity is only scheduled to last 6 months, the State/Territory might set the redetermination period for that family at 6 months. Under CCDBG reauthorization, all States/Territories are now required to use a minimum 12-month redetermination period, meaning a family’s CCDF eligibility will last for at least a year before it must be recertified. The 25 States/Territories that did not previously use a 12-month redetermination period will have to implement at least a 12-month period to meet the new requirements of the law. Higher income limits for continuing eligibility (sometimes referred to as tiered eligibility) allow families to remain eligible for subsidies even when their income increases above the initial income limit. For example, in a State/Territory with an initial monthly income eligibility limit of $1,250 for a three-person family and a continuing income eligibility limit of $1,500, a family of that size must have income at or below $1,250 to initially qualify for assistance, but if that family’s income increases above $1,250, the family can continue to receive a subsidy as long as their income does not exceed $1,500. By establishing higher continuing eligibility thresholds, States/Territories allow families to work toward increasing employment and income without losing their child care benefits. Under CCDBG reauthorization, States/Territories may continue to use income thresholds below 85 percent of SMI when determining initial eligibility, but once a family qualifies for assistance and begins their eligibility period, the States/Territories must continue to provide assistance during the entire eligibility period as long as the family’s income does not exceed 85 percent of SMI and the family does not experience a permanent change in employment, education, or training status. This is especially beneficial for families whose earnings fluctuate during the year (such as those with seasonal employment) because they will no longer lose assistance as the result of a small or temporary increase in income. Throughout the eligibility period and prior to redetermination, families are often required by States/Territories to report changes that might affect their eligibility. For example, States/Territories might require families to report any changes in employment status or income. In addition, how often families must report changes, how they are required to report changes, and the level of documentation they must provide when doing so can all affect their ability to continue receiving assistance. Policies that reduce interim reporting requirements have the potential to reduce the workload of state or local agencies, as they will have to process fewer changes that might have little or no impact on a family’s eligibility. Fewer reporting requirements can also reduce the burden on families if they are able to submit documentation less frequently or only report permanent changes in circumstances. As with redetermination periods and income limits for ongoing eligibility, reporting requirements prior to CCDBG reauthorization varied by State/Territory. As of October 2014, all States/Territories required families to report at least some interim changes, with all but three States/Territories requiring families to report changes in employment. All but four States/Territories required families to report changes in income in at least some circumstances. Of the States/Territories that required changes in income to be reported, thirty-four required families to report all changes in income, whereas eighteen required families to only report changes over a certain amount. Appendix table 1 provides more detail about States’/Territories’ interim reporting requirements for October 2014. Neither CCDF reauthorization nor current regulations explicitly discuss interim reporting. As States/Territories work to implement the longer eligibility periods and accommodate fluctuations in income, they may also consider ways to reduce reporting requirements. While the legislation does not focus on interim reporting requirements, it does outline requirements for States/Territories to describe in their CCDF Plans their policies for simplifying the redetermination process and outline how they will ensure parents’ employment and other activities are not disrupted as a result of the process. For example, instead of requiring parents to bring paper documentation to an agency office during business hours, a State/Territory could allow families to report and verify eligibility information electronically. While the new law requires States/Territories to reassess the reporting requirements for redetermination and reduce the burden on families, States/Territories may have flexibility in establishing these policies since the new law does not provide explicit requirements. However, more guidance or additional requirements may be outlined in the new regulations. The continuity of child care subsidies is affected not only by the length of the redetermination period, but also by how quickly families are phased off of assistance once their income is over the eligibility threshold but less than 85 percent of SMI. When a family’s income exceeds the income limit and the family no longer qualifies for assistance, if the family immediately loses subsidies and cannot afford the full rate charged by the provider, the family might need time to make alternative child care arrangements. Gradual phase-out periods can help families make new arrangements for child care, if necessary and help families avoid gaps in child care arrangements. Prior to CCDBG reauthorization, there was wide variation across programs in when services could be terminated if a family was no longer eligible for the subsidy. As of October 1, 2014, in the great majority of States/Territories (48), families were given a grace period between when they were notified of the termination and when services were terminated, ranging from 5 to 30 days. Three States/Territories terminated subsidies retroactive to the date of the change in eligibility status or upon notification of a change in eligibility status. The new legislation requires States/Territories to include in their CCDF Plans policies for a graduated phase-out of care at the end of the eligibility period when the family’s income exceeds the State’s/Territory’s income limit, but the parents continue to participate in work, training, or education activities and the family’s income is below 85 percent of SMI. While the legislation specifically states that States/Territories cannot end the subsidy during the eligibility period if the family’s income exceeds the State’s/Territory’s income eligibility threshold but stays below 85 percent of SMI, it is unclear how States/Territories will set income thresholds at the end of an eligibility period. In particular, it is unclear whether States/Territories will choose to terminate the subsidy at the end of the eligibility period if the family’s income remains below 85 percent of SMI but exceeds the State’s/Territory’s eligibility threshold. Over the next several years, State/Territory CCDF policies will change significantly as a result of the reauthorization of the CCDBG Act. Policy changes that affect ongoing eligibility requirements could result in changes in the numbers of eligible families and children at a given point in time. For example, lower-income families, who are more likely to experience fluctuations in their income, might be more likely to retain subsidies under policies that allow for longer eligibility periods and higher income thresholds for families already receiving assistance. A study using data from the Survey of Income and Program Participation (SIPP) found that over a nearly three-year period, low- and middle-income families experienced an average of 2.6 “shocks”, or periods where their income increased or decreased more than 33 percent from their average income.8 Lower-income families experienced more shocks on average. Families receiving subsidies will now be able to stay on the program during the full eligibility period even when their income changes, as long as their income remains below 85 percent of SMI. While the new policies could result in significant changes in the number of children and families who are eligible for assistance at a given point in time, it is unclear at this time how the actual caseloads will change as States/Territories make decisions about how to implement the new requirements and how other related policies might change. States/Territories will face decisions about how to implement the new requirements, and how to fund the changes, as the new law did not guarantee higher federal funding.9 Over the next several years, as States/Territories revise their policies to come into alignment with the new law, additional information about CCDBG reauthorization and guidance for States/Territories, how and when State/Territory policies change, and how caseloads change, will be available through several public resources. Resources from the CCDF Policies Database: The CCDF policies shown here are taken from the CCDF Policies Database. The CCDF Policies Database tracks State/Territory policies over time, with hundreds of variables tracking policies related to family eligibility, application and wait list procedures, family copayments, provider reimbursement rates, and other provider policies. The Database is maintained by the Urban Institute and funded by the Office of Planning, Research and Evaluation within the Administration for Children and Families, U.S. Department of Health and Human Services. 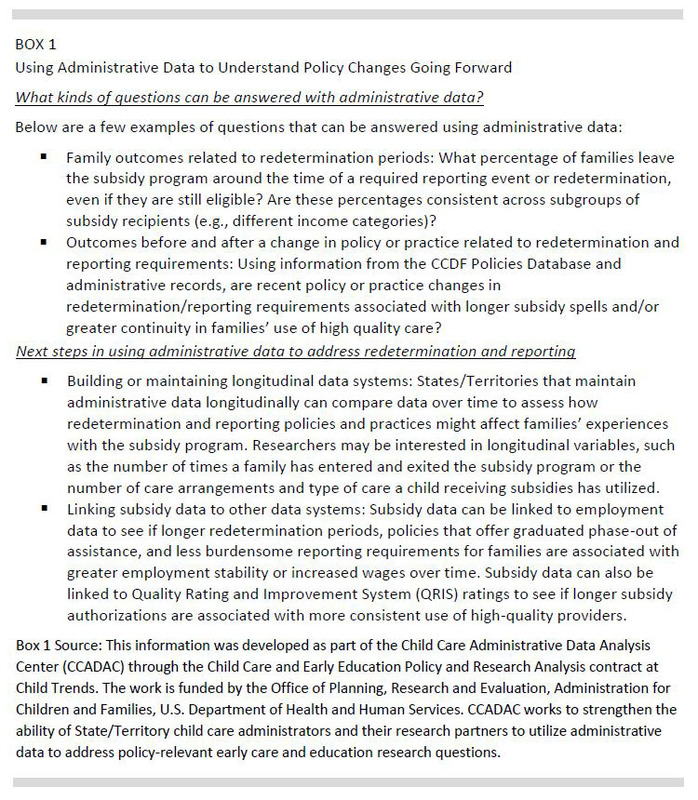 The data are available for public use through annual published reports and access to the full Database detail.10 This brief is one in a series of briefs on the implications of CCDBG reauthorization on state child care subsidy policies. The other two briefs describe the changes to requirements for eligibility during periods of job search and the changes to requirements for legally unregulated child care providers. Additionally, policy changes resulting from CCDBG reauthorization will be picked up as part of future updates to the Database, with the data made available for public use. Resources from the Office of Child Care: Information on CCDBG reauthorization, as well as information on CCDF caseloads and spending, can be obtained from the Office of Child Care (OCC), within the Administration for Children and Families, U.S. Department of Health and Human Services. Resources from the Child Care Administrative Data Center (CCADAC): CCADAC, a project run by Child Trends and funded by OPRE, supports the use of administrative data to address policy-relevant early care and education research questions for state child care administrators and their research partners.13 State/Territory leaders and researchers may be interested in analyzing data to understand the effects of changes to ongoing eligibility requirements. Analysis of administrative data is a cost-effective means of assessing the intended and unintended outcomes of policies and administrative procedures. Box 1, with information provided by CCADAC, provides examples of questions that can be answered with administrative data and next steps that States/Territories can take now to capture relevant information in their administrative records. Kathryn Stevens is a research associate in the Income and Benefits Policy Center at the Urban Institute. Her work focuses on child care subsidy policies, tax policy, and government programs that serve low-income families. She serves as project manager for the CCDF Policies Database. Lorraine Blatt is a research assistant in the Income and Benefits Policy Center at the Urban Institute. She works primarily on child care subsidy policies and education and training initiatives. This brief was funded by the Office of Planning, Research and Evaluation (OPRE). The authors would like to thank Linda Giannarelli (the Urban Institute) and Kathleen Dwyer (OPRE) for their insight during the drafting of the brief and their review of various drafts. The authors would also like to thank Gina Adams and Monica Rohacek of the Urban Institute for reviewing and providing feedback on the brief, as well as for their ongoing guidance on the project. Particular thanks are owed to the CCADAC team—Kelly Maxwell, Van-Kim Lin, Nicole Forry, and Carlise King—for their insight on using administrative data, for providing the supplemental material included in Box 1 of the brief, and for reviewing the draft brief. Finally, the authors would like to thank Rachel Schumacher (Director of OCC), Dawn Ramsburg (OCC), Minh Le (OCC), Amanda Clincy (OPRE), and Elizabeth Shuey (OPRE) for reviewing the draft brief, and Andrew Williams (OCC) for providing input on the overall plan and policy topics for the brief. This brief is in the public domain. Permission to reproduce is not necessary. Suggested citation: Minton, Sarah, Kathryn Stevens, and Lorraine Blatt (2016). Implications of Child Care and Development Block Grant Reauthorization for State Policies: Changes to Requirements for Ongoing Eligibility. OPRE Report 2016-23, Washington, DC: Office of Planning, Research and Evaluation, Administration for Children and Families, U.S. Department of Health and Human Services.